I felt incredibly fortunate to be able to participate in the blog tour for Amanda Brandl's brand new range of fabric called Taking Flight. Amanda is a beautifully gifted artist, designing fabrics for Kennard and Kennard with a uniquely Australian feel. Her prints encapsulate the special qualities of our native wildlife and beautiful plants. For all too long, typical Australiana fabrics have focused on the rust, ochre and green colour ways. Which, of course, makes sense when you view the harsh desert landscape towards the centre of this vast country. But all too often, the striking colours of Australia, the piercing hues of blue, the brilliant yellows and sweet pinks have been neglected, in favour of more traditional prints and colours. So it's wonderful to see Amanda's fresh take on Australian fabric, with her new ranges, Taking Flight and Bush Gum Blossoms. The designs feature cute creatures and beautiful plant life, with a colour pallette versatile for all quilters and sewists. Seeing as we are expecting our third baby in August (only 20 weeks away!) 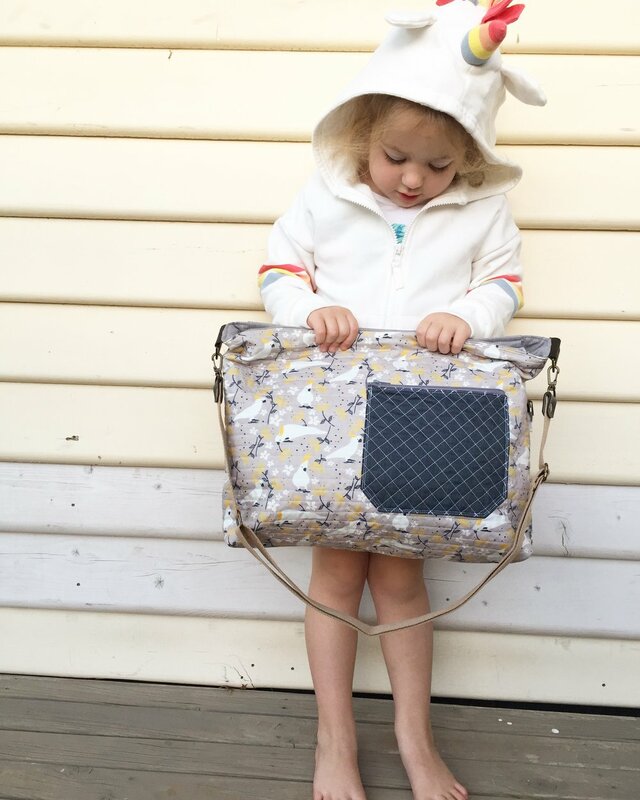 I was instantly drawn to the notion of creating a new nappy bag from the Taking Flight range. We are incredibly blessed to have such a rich bird life in Australia, and the cockatoo is one of my favourites. Even if they can wreak havoc with their sharp beaks, and devour my tomato crop in a matter of minutes, I still adore their quirky habit and fun spirit. So the grey cockatoo print was my ideal choice. I constructed my nappy bag to cater to my needs for the new baby - so a large open top zip was necessary, along with plenty of pockets and hardware to attach things. I always find the addition of D-Ring hardware incredibly necessary with these types of large bags - they are the perfect quick anchor point for dummies (pacifiers for you overseas folk!) and car keys - two things you don't want to misplace with a newborn! 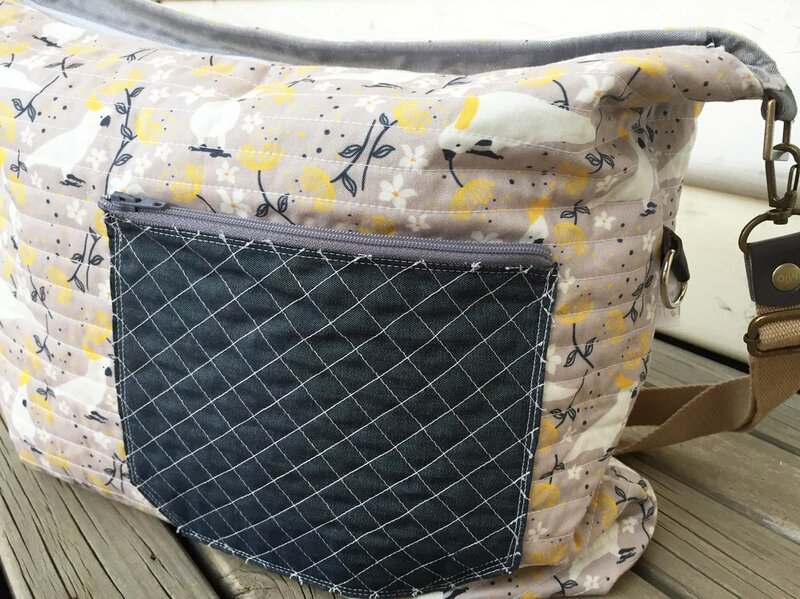 I've always enjoyed making this style of bag, and some of you may remember my first nappy bag I created back in 2012. Creating bags such as these really give you the option to personalise them to suit your needs and taste. I wanted the cockatoo fabric to be my main feature, hence why I only adorned the outside with some lovely denim chambray for my pocket, just to add a pop of colour. I used a bright orange bird print from the Taking Flight collection for my large interior pocket - something about it being easy to see straight away appealed to my future tired mum eyes. I love the surprise burst of colour it creates when you look inside the bag. I may have cheated slightly by purchasing the outer bag strap from my wonderful local craft store here in Healesville, Crumbz craft. I really like the professional edge it creates to my bag overall, and I think it sits really nicely with the cockatoo fabric. I was really impressed with the quality of this fabric, right from the design and the colours, through to the feel of the fabric, and it's strong, close weave. I was honoured to have been able to take part in Amanda's celebration of her Australian fabrics, and I hope I've done those sweet cockatoos justice. I'm very much looking forward to showing off my new nappy bag when this little baby arrives - guaranteed no other mum will have one like mine! If you'd like the opportunity to win some of Amanda's lovely new fabric from Taking Flight, I have some pieces to giveaway! One lucky winner will receive a 50cm piece of the beautiful blue bush floral, and a 25cm piece of the funky teal magpies. If you'd like to win, simply leave a comment on this post. I'll randomly select a winner on Monday the 2nd of April at 8pm AEST. 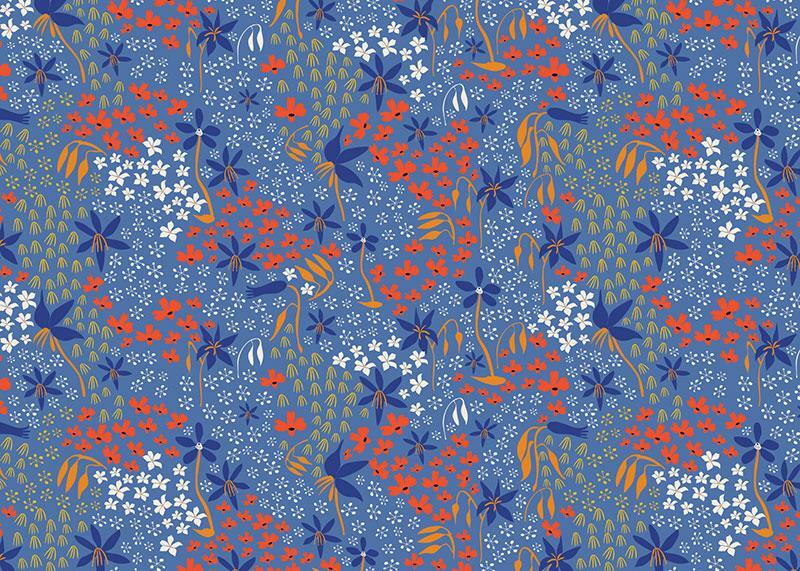 To view the full collection of Amanda's fabric, click here for Taking Flight, and here for Bush Gum Blossoms. 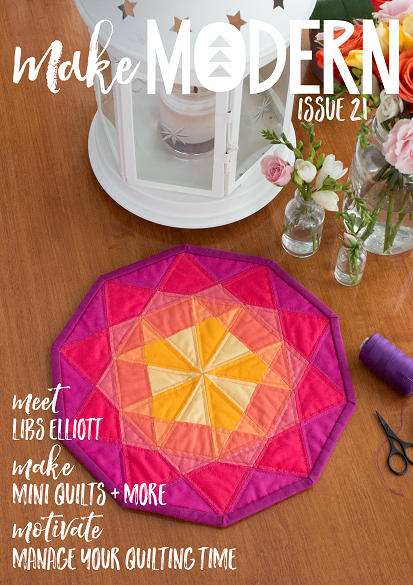 The blog tour has been a wonderful showcase of Australian talent, so be certain to visit the Instagram page of Amanda to view the previous projects made over the last few weeks, or check out the schedule on Amandas website.